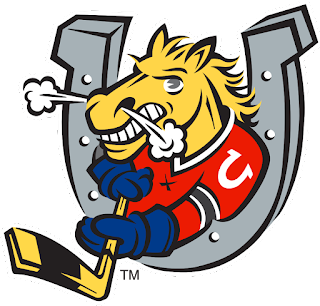 All-Time Barrie Colts Dream Team by @ryanpmcarthur. #OHL - Very Barrie Colts | A website covering the Barrie Colts of the OHL. Growing up in Barrie, Ontario provided me with some rich hockey experiences. The Barrie (Dunlop) Arena granted a feeling of old-school hockey nostalgia. Historic games, hardwood floors, long blue benches for seating, and an overall barn-like atmosphere made it a place of legend. Old Barrie Flyers (Don Cherry’s junior team) Memorial Cup and other championship banners lined one of the walls. It was by far my favorite arena to play in as a ‘AA’ level minor hockey player. It was also the rink that I saw the 1993 Jr. B Barrie Colts pack the seats with spectators, march out wearing double blue, and win the Sutherland Cup (shout-out to John Madden, Steve Walker and Mike Peron). This storied arena was the location of the first ever game played by the OHL Barrie Colts in the 1995-96 inaugural season. The game needed to be played here, since construction of the Barrie Molson Centre had not been completed yet. This was more than fine with me and I’m proud to say that I attended the game (there was no way I would miss it). The only thing I remember about the game was the play of Alexandre Volchkov, who was an import player from Russia. He was only 17 years old, but he was easily the Colts’ best player with his speed, flare, and raw natural talent (remind you of someone from this year’s team?). I started with his name and drafted a rough depth chart of my all-time favorite Barrie Colts players. I put current Barrie Colts superstar, Andrei Svechnikov, on Volchkov’s line and my exercise eventually turned into a more polished piece. There weren’t any criteria used to select this team, other than to pick my favorite players to ever play for the Barrie Colts. After fine tuning this team and putting a lineup together, I had created my ‘All-Time Barrie Colts Dream Team.’ I don’t expect everyone to fully agree with my selections. It’s not about who had the best stats, who had the best pro careers after junior, or what combination of players would have won the most games. This is merely my own personal ‘All-Time Barrie Colts Dream Team’ that I would have the must fun watching in a live game (if it were possible to get them together in the prime of their junior hockey glory). It goes without saying that some very, very good players had to be left off the team (notable omissions listed at the bottom – even that part was difficult to complete!). Also, there isn't a "first line" - this team has a "next man up" mentality and rolls all the lines/defense pairings. Please see the team below (note: statistics do not include playoff games). Andreas Athanasiou had 78G and 84A for 162 points in 132 GP with the Barrie Colts. He was selected in the fourth round (110th overall) in 2012 NHL Entry Draft by the Detroit Redwings. Mark Scheifele had 84G and 133A for 217 points in 158 GP with the Barrie Colts. He was selected in the first round (seventh overall) in 2011 NHL Entry Draft by the Winnipeg Jets. Aaron Luchuk (currently on the team) has 22G and 42A for 64 points in 38 GP with the Barrie Colts. He was signed as a free agent by the Ottawa Senators. Alexandre Volchkov had 66G and 80A for 146 points in 103 GP with the Barrie Colts. He was selected in the first round (fourth overall) in 1996 NHL Entry Draft by the Washington Capitals. Sheldon Keefe had 62G and 101A for 163 points in 94 GP with the Barrie Colts. He was selected in the second round (47th overall) in the 1999 NHL Entry Draft by the Tampa Bay Lightning. Andrei Svechnikov (currently on the team) has 40G and 32A for 72 points in 44 GP with the Barrie Colts. He is eligible for the 2018 NHL Entry Draft. Andrew Mangiapane had 118G and 143A for 261 points in 195 GP with the Barrie Colts. He was selected in the sixth round (166th overall) in the 2015 NHL Entry Draft by the Calgary Flames. Daniel Tkaczuk had 145G and 189A for 334 points in 238 GP with the Barrie Colts. He was selected in the first round (sixth overall) in the 1997 NHL Entry Draft by the Calgary Flames. Kevin Labanc had 81G and 188A for 269 points in 198 GP with the Barrie Colts. He was selected in the sixth round (171st overall) in the 2014 NHL Entry Draft by the San Jose Sharks. Jan Bulis had 71G and 91A for 162 points in 123 GP with the Barrie Colts. He was selected in the second round (43rd overall) in the 1996 NHL Entry Draft by the Washington Capitals. Bryan Little had 153G and 189A for 342 points in 247 GP with the Barrie Colts. He was selected in the first round (12th overall) in the 2006 NHL Entry Draft by the Atlanta Thrashers (Winnipeg Jets). Dmitry Sokolov (currently on the team) has 30G and 28A for 58 points in 29 GP with the Barrie Colts. He was selected in the seventh round (196th overall) in 2016 NHL Entry Draft by the Minnesota Wild. Luch Nasato had 26G and 108A for 134 points in 177GP with the Barrie Colts. He had a Barrie Colts all-time record 657 PIM. Aaron Ekblad had 40G and 76A for 116 points in 175GP with the Barrie Colts. He was selected in the first round (first overall) in the 2014 NHL Entry Draft by the Florida Panthers. Martin Skoula had 21G and 82A for 103 points in 133GP with the Barrie Colts. He was selected in the first round (17th overall) in the 1998 NHL Entry Draft by the Colorado Avalanche. Rasmus Andersson had 21G and 103A for 124 points in 131GP with the Barrie Colts. He was selected in the second round (37th overall) in the 2015 NHL Entry Draft by the Calgary Flames. Eric Reitz had 20G and 58A for 78 points in 194GP with the Barrie Colts. He was selected in the sixth round (170th overall) in the 2000 NHL Entry Draft by the Minnesota Wild. Alex Pietrangelo had 9G and 20A for 29 points in 25GP with the Barrie Colts. He was selected in the first round (fourth overall) in the 2008 NHL Entry Draft by the St. Louis Blues. Brian Finley had an OHL career GAA of 2.89, 0.916 SAV% and a 95-44-3 record. He was selected in the first round (sixth overall) in the 1999 NHL Entry Draft by the Nashville Predators. Mackenzie Blackwood had an OHL career GAA of 2.94, 0.910 SAV% and a 84-42-4 record. He was selected in the second round (42nd overall) in the 2015 NHL Entry Draft by the New Jersey Devils. Dale Hawerchuk is my selection for coach. Bert Templeton would have been another good choice, but I’m going with the current bench boss. Most notable omissions: Michael Henrich, Mike Jefferson (Danton), Ryan Barnes, Denis Shvidki, Jan Platil, Blaine Down, Alexandre Burmistrov, Stefan Della Rovere, TJ Brodie, Luke Pither, Bryan Cameron, Paulo Colaiacovo, David Chant, Peter Di Salvo, Andrew Perugini, Michael Hutchinson, Andrew Marshall, Blaine Down, Dalton Prout, Kyle Clifford, Tanner Pearson, Colin Behenna, Steven Beyers, Mathias Niederberger, Vladimir Nikiforov, Hunter Tremblay, Alex Hutchings, Zach Hall, Ivan Telegin, Anthony Camara, Brendan Lemieux, Joseph Blandisi, Justin Scott, Michael Webster, Ryan Suzuki, Joey Keane, Lucas Chiodo, Zach Magwood, Jason Willms, Justin Murray, Nathan Allensen, and Tyler Tucker. In bold are the toughest omissions. Bob @Bardobber notable omissions: Blaine Down (subsequently added above) and Michael Christian. Colts Cult @ColtsCult notable omissions: Vladimir Nikiforov and Ivan Telegin (both subsequently added above). Devon @DevoSee had Niederberger ahead of Blackwood. Niederberger was the toughest omission from the team.